Well, I call this theme nikola-bnw(brave new world). No special meaning. It is hosted on Github. Download this repository and put it under '/themes/' folder. 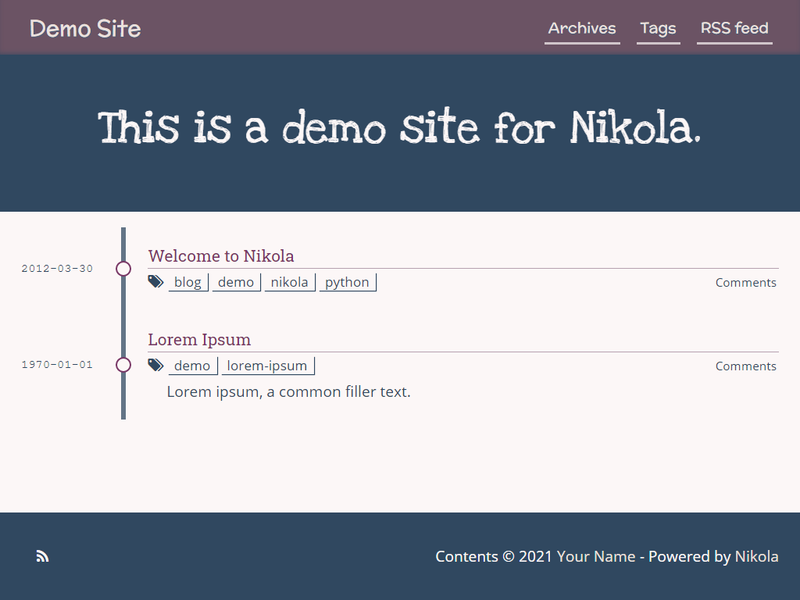 Modify your conf.py and set THEME = "nikola-bnw". Update: I've generated the css written by less, so you don't need to install less now, just do: 1. Modify your confiy.py and set USE_BUNDLES = True. 2. Done! Also note that the theme use flexbox CSS attribute, so make sure to use modern browser if it is not working well. The theme had been added to Nikola Theme Gallary, so you can install it by: 1. nikola theme -i bnw 2. Modify your conf.py and set THEME = "bnw" 3. Modify your confiy.py and set USE_BUNDLES = True. 4. Done! Change them to whatever you like. # Pre-built CSS files are only included when using bundles.